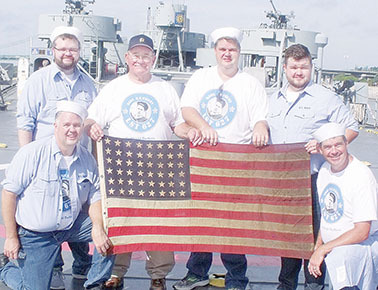 A son and five grandsons of the late Raymond E. Wright of Albion had an opportunity last weekend to see and experience some family naval history. Steve Wright of Albion, along with his five sons, traveled to Bettendorf, IA, to visit the last remaining operable World War II vintage LST. This is a ship that played an important role for the United States in World War II, delivering battle-ready tanks, troops and supplies directly onto enemy shores. Radioman Second Class Raymond E. Wright served aboard LST 627 for his entire term of service in the Pacific Theater. He boarded the ship when it was new on July 3, 1944, at the shipyard in Seneca, IL. The ship sailed down the Illinois River to the Mississippi River, then to Gulf of Mexico, where it picked up a full crew and supplies. LST 627 then sailed through the Panama Canal and into the Pacific, where it served the duration of the war. Accompanying Steve on the trip were his sons Doug, Dan, Dave, Dana and Darren, along with an American flag, stained with diesel smoke from LST 627. Raymond had brought the flag home after the war ended. For the Wright family, this was an opportunity to tour a piece of living American history, on display at Bettendorf from Aug. 30 through Sept. 3. The display at the Isle Casino Hotel featured the USS LST (Landing Ship Tank) 325, a vessel measuring 328 feet long and 50 feet wide and virtually identical to Raymond’s ship, LST 627. Read the complete story in the Sept. 5 Albion News & Petersburg Press, Print and E-Editions.